Conventional wisdom would state that the best way to create good usability in your desktop application would involve copying popular design standards. For example, users are accustomed to seeing a menu bar with Save and Open under "File" and Cut, Copy, and Paste under "Edit." And then there are keyboard shortcuts like Ctrl+S to save. There's really no point in changing that up on users. I mean, you wouldn't want to put Copy and Paste under "File" instead. And just think about how awful it would be if Ctrl+S closed your application instead of saving your work. However, some applications have abandoned the File/Edit menu bar mentality entirely. And every once in awhile I run across a slightly non-standard application that looks really slick aesthetically while also being intuitive and easy to use. The Microsoft Zune software is a good example of that. 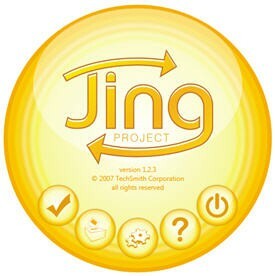 And I'm also a fan of Jing from TechSmith. Jing looks very, very non-standard in that screenshot but once you actually use it you'll quickly see that they get away with it because it's such a simple application to begin with. I can't help but think of what an impact the web has made. After all, historically web usability patterns have been somewhat different from desktop applications. But why should it be that way? Almost everyone using desktop applications also uses the web. So wouldn't it make sense that these usability standards can play together? Well I think that's exactly what's happening. The creative nature of website design is now influencing the design of desktop applications as well. And now that the technology exists to make this happen easily we're seeing more and more of this creativity. I believe that when you can create an aesthetically pleasing interface with a usable and intuitive flow to it, you will inevitably create a greater impact. It's one thing to have a simple, standard-looking Windows application. But if it looks good too you'll give your users the impression that it's really well polished and more inviting to use. And that may just give you the edge over your competition. I'm building Data Comparisons in WPF. And WPF allows more flexibility than any Windows development technology before it. It's easy to let all of this power go to your head. I can just think back to all the misuses of Flash in website design that I've witnessed. If you focus too much on achieving the cool factor you can easily overlook the most important point: Users have to be able to use your software. So I'm avoiding all urges to create a confusing layout, obscure or hidden buttons, elaborate screen transitions, and sweet (slow-loading) sound effects. I suppose my opinion about all of this is that usability should always be the top priority. If your application somewhat resembles and behaves like something your target audience has used before, they're going to have a much easier time with it. Ideally, they won't ever have to look at your help documentation. But that doesn't mean your application has to be ugly.